When you are charged with a crime involving illegal drugs, the consequences can be dire. It is crucial for you to work with a drug crimes defense attorney in Las Vegas who can be a strong advocate and aggressively defend you from what can be very serious charges. In Las Vegas, the lawyers at Guymon & Hendron have extensive experience in the courtroom and have worked on thousands of cases in their years of practice. Our attorneys know that facing drug charges in Nevada can make for an uncertain, scary time, and they pledge to stand by the people they represent throughout the process. There are several ways that you might find yourself charged with drug-related crimes. Drug possession charges, for example, often grow out of traffic stops. Someone who is pulled over for speeding or expired license plates might face more serious charges if drugs such as marijuana or cocaine are found. In other cases, law enforcement officials might focus on someone because of suspected drug trafficking activities. This could lead to more serious charges and more complicated issues than simple possession. Regardless of how you came to find yourself facing crimes involving illegal drugs, our attorneys can offer a solid defense built on experience. 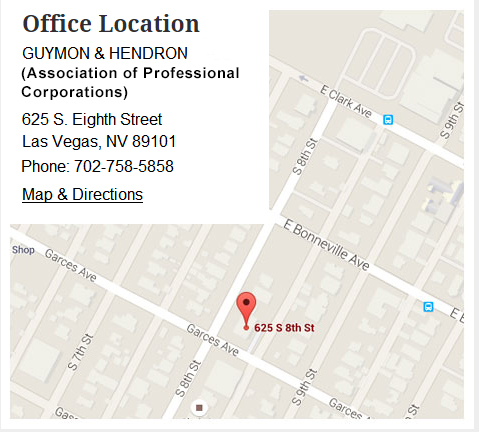 Learn more about Guymon & Hendron today. Call our law firm for a free, no-risk consultation about your case at 702-758-5858, or you can reach us online through our online contact form.